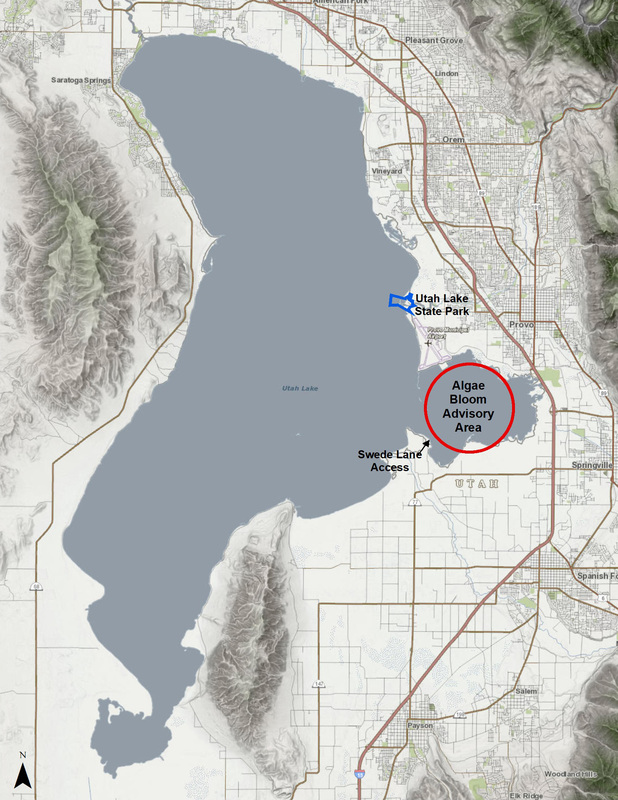 The Utah County Health Department (UCHD) is warning the public to stay out of Provo Bay after DEQ sampling showed toxin and cyanobacteria levels that exceeded health-based thresholds. 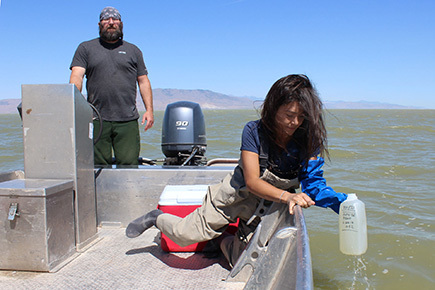 UCHD is posting warning signs at Swede Sportsman Access near Provo Bay to warn people about recreating in the Bay due to the presence of potentially harmful algal blooms. DEQ water-quality crews responded on June 6, 2018, to a report of an algal bloom in Provo Bay and collected five samples at various locations at and around the Swede Sportsman Access. Sample results detected the presence of two cyanotoxins, anatoxin-a and microcystin, with one sample at the Swede Sportsman Access (5.5 micrograms per liter (µg/L) microcystin) exceeding the Utah Department of Health/ Utah Department of Environmental Quality health-based threshold for recreational waters. All three samples sent to the lab for cell-count concentrations exceeded the health-based threshold, with cell counts ranging from approximately 400,000 cells per milliliter (cells/ml) to more than 21 million cells/ml. The cell count is an indication of harmful levels of cyanobacteria. Division of Water Quality (DWQ) crews will continue to collect additional samples around the lake beginning June 11, 2018. 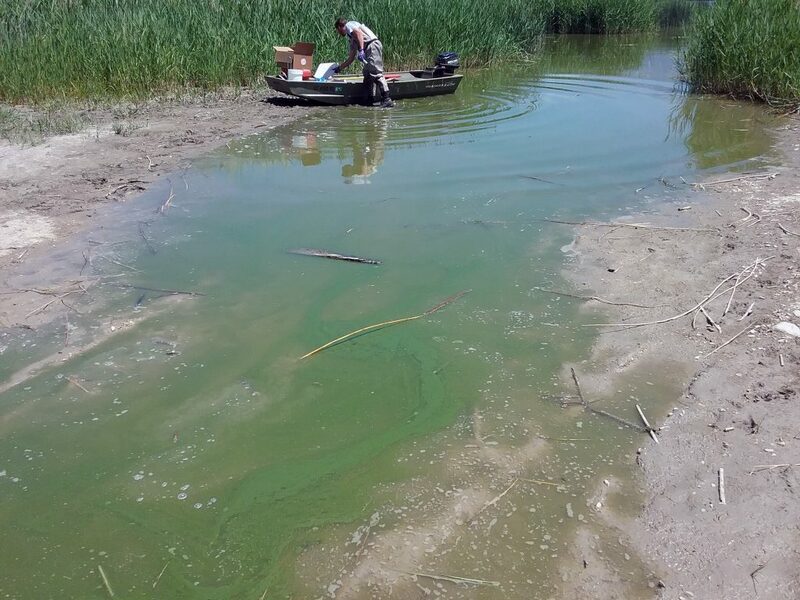 Although blue-green algae are a natural part of many freshwater ecosystems, under the right conditions they can proliferate rapidly. High levels of nutrients in the water, combined with warm temperatures, abundant sunlight, and calm water, can promote growth, resulting in extensive blooms. These blooms consist of cyanobacteria (often referred to as blue-green algae), a type of bacteria that poses risks to humans, wildlife, domestic animals and fish. Symptoms of exposure include headache, fever, diarrhea, abdominal pain, nausea and vomiting, and sometimes allergic- like reactions from skin contact. For concerns about possible human exposure, call the Utah Poison Control Center at 800-222-1222. DEQ will continue to provide updated information at habs.utah.gov. View the full news release here. Provo Bay Map. Click for full view.